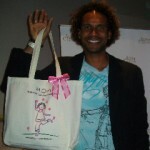 It is SO cool to see Genai Kerr with a No Mommy’s Perfect Tote Bag … in my dreams he kept it for himself and takes it to the gym! Hey Genai, you can order more for your nieces, nephews, friends, etc.! You have found the “perfect” gift.